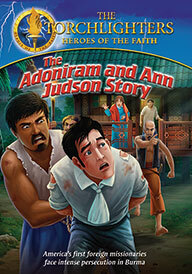 Follow the extraordinary adventures of Adoniram Judson and his wife Ann, the first foreign missionaries from the United States. Having been turned away from India, the young couple sets out for Burma where they work to reach souls in a land where professing Christ would mean certain death. When treacherous religious leaders falsely accuse Adoniram of spying, Burma’s ruthless king throws him into prison, leaving Ann and her unborn child to struggle alone. Will Adoniram escape death and reunite with his wife and child? Will their Bible translation, the only one of its kind, be lost forever? Find out in this episode of The Torchlighters.